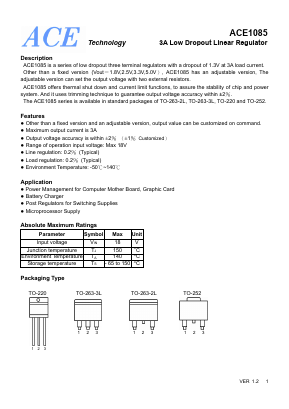 ACE108518YM+ Datasheet PDF - ACE Technology Co., LTD.
ACE1085 is a series of low dropout three terminal regulators with a dropout of 1.3V at 3A load current. Other than a fixed version (Vout＝ 1.8V,2.5V,3.3V,5.0V） , ACE1085 has an adjustable version, The adjustable version can set the output voltage with two external resistors. output value can be customized on command.